Sports utility vehicles (SUVs) waiting to be exported are seen at a port in Lianyungang, Jiangsu province, China, April 5, 2018. U.S. President Donald Trump on Monday touted the United States' "very good relationship with China" and his "good" friendship with President Xi Jinping, but again accused China of taking advantage of the United States for far too long. Surrounded by Cabinet officials before a White House meeting Monday, Trump said the trade deal between the U.S. and China includes "the most lopsided set of trade rules and regulations that anybody has ever seen." Rather than blame Beijing, however, Trump criticized previous U.S. presidents, representatives, and negotiators for the current trade situation. 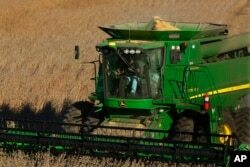 Trump threatened to impose tariffs on an additional $100 billion worth of Chinese goods last week after Beijing threatened to target $50 billion worth of U.S. products — including soybeans and small aircraft — for possible tariff increases. FILE - A farmer uses a combine to harvest his soybean field in Loami, Illinois, Oct. 21, 2014. "If we do a deal with China, if during the course of negotiation, they want to hit the farmers because they think that hits me, I wouldn't say that's nice, but our farmers are great patriots. They understand that they are doing this for the country and we'll make it up to them. In the end, they are going to be much stronger than they are right now," Trump said. Earlier Monday, Trump decried "stupid trade" with China, contending that U.S. automakers are hurt by hefty tariffs on their exports while the U.S. imposes a much smaller tax on imported Chinese vehicles. Sales of Chinese-made cars in the U.S. are minimal, but some U.S. automakers have started making certain models in China for export to the U.S. Sales of U.S. cars in China subject to the 25 percent import tax push the cost of the vehicles thousands of dollars higher for Chinese buyers than the same models sell for in the U.S.
Trump's broadside against China came a day after he predicted the U.S. and China would resolve their escalating fight over tariffs; but, there was no immediate end to the standoff, with the Chinese Foreign Ministry saying that trade talks with the U.S. are impossible under current conditions. "China will take down its Trade Barriers because it is the right thing to do," Trump tweeted Sunday, without offering any direct information. "Taxes will become Reciprocal & a deal will be made on Intellectual Property. Great future for both countries!" China and the U.S. have published lists of goods they intend to tax, with the U.S. hitting steel and aluminum imports from China, along with aerospace, tech and machinery goods. Other levies would target medical equipment, medicine and educational materials. Trump's chief economic adviser, Larry Kudlow, on Monday played down fears the world's two largest economist are on the brink of a trade war. "First, we have a very strong economy," said Kudlow, who also emphasized "no tariffs have been enacted" and that both sides are engaged in conversations. "That is not a trade war," he said.